That’s exactly what you get when you choose Anchor kitchenware! Still proudly made in the good old U-S-of-A, Anchor is built tough and designed to last through pretty much anything in the kitchen. That means it’s freezer safe, microwave safe and oven safe, and you can even put it in the dishwasher to clean (after all, an anchor’s just no good if it can’t handle a little water). 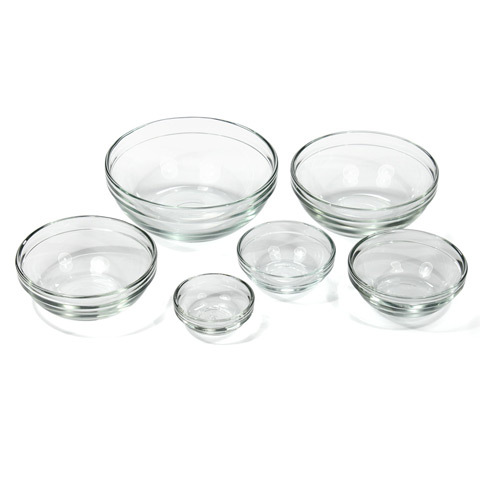 Everyone knows you’re not a proper chef if you don’t have a set of little bowls, one for every ingredient. Anchor’s Prep Bowl Set comprises of six little bowls – from the small to the teeny to the microscopic. They’re so cute! And so useful. Absolutely ideal for anyone who likes to pretend they’re the next Jamie or Nigella. If you want something hard-wearing and designed to help you hold your own in the kitchen, then grab your Anchor. Anchors away! Made in the United States from tough tempered glass. Glass won’t warp or stain with years of use. Presented as a set of six. 473ml Bowl - 14cm (w). 295ml Bowl - 12cm (w). 177ml Bowl - 10cm (w). 118ml Bowl - 8cm (w). 59ml Bowl - 7.5cm (w). 29.5ml Bowl - 6cm (w).